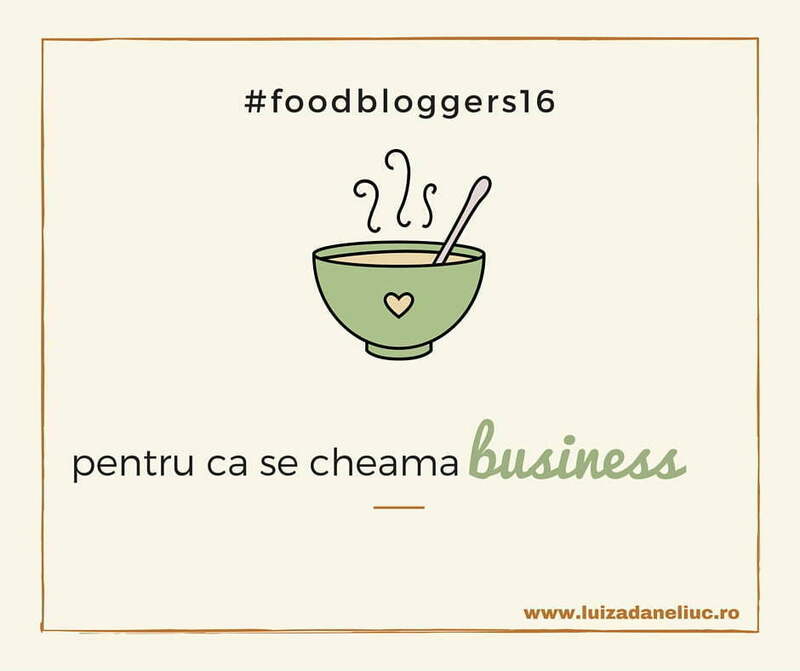 Food Bloggers Conference – Summer Editon has reached many sensitive and important points for any blogger, not just for the food NIST. A conference that, overall, put the issue of very mature blogging, assumed and sent a clear message: The blog is a business, treat it as such if you want to be taken into account by the brands. The danger to small bloggers and not only, is that, these not having a position of force, meaning a financial security that comes from an adjacent job, they become vulnerable to the decision to refuse a campaign that does not match them. Here I think the management vision intervenes, the long-term plan that any blogger should have. Any business starts at the bottom and has difficulty. No matter where you are today, you must maintain your position, your verticality and trust your vision. Be assured that a single compromise will set a dangerous precedent, put your blog in a very bad position, send you an erroneous message about who you are as a person (a person who can be easily pushed towards compromises), and overall you’re going to make a very bad first impression. Maybe you’ll win in the short term, part of that campaign that doesn’t suit you, but you have no idea what you’re missing in the long run! You’re losing your integrity and your chance to make a strong impression. If you were to sumarizam some of the must-have of a successful relationship between bloggers and brands, Blogerii want mainly development a personal relationship. Yes, we have to admit that we feel good when we count on other people, when we are not strictly regarded as simple service providers, or as a necessary evil. It flatters us that people respect and admire our work. They call us creative and pay us for it. We could say that friendship and respect are the words of order in collaborating with bloggers. But Then again, these are the characteristics of any successful business relationship. And I want such clients and relationships and I don’t think there’s a service provider that doesn’t aspire to that. On the other hand, the agencies want to work with vertical, assumed people, who are not given the wind, who have opinions contrary to the client and which they express reasoned. That’s the difference between Hatereala and opposite opinion. Argument. For the agency and customer, the blogger presents interest in the customized content it produces, for the quality and originality it delivers. The unique and personalized story created around a product, that captivates the public’s attention and that makes the blogger so different from the rest of the promotional methods. Bloggers have basically taken the collective mentality, the place of old storytellers. It creates a story around a personal experience, which gives great credibility to the gang involved in the story. However, brands do not want to work with bloggers who do not understand to treat their blog as a business or even if they try to do so, they have no idea how to run that business. It is not all to understand the message: Take your blog seriously! Perhaps many have understood and want to apply this concept, even are willing to invest in the blog in the picture and technical part, but not all were born managers. Not everyone has vision. Many of them have only passion. It’s a vicious circle. You have to be a sales man, and marketing and good man at all. If you’re not, go to school: do some online courses, follow the work of the people you admire, get your heart in your teeth and ask a person to mentor you. But, choose your mentor Wiseley; It’s a crucial decision that will track you maybe for the rest of your life as a blogger. Passion propels you among those who write unique and quality content, but do not maintain among those looking for brands. For that you have to have a business strategy and head for business to put it into practice. Like in any business, you have to take some risks. The risk that your blog investment does not yield results. If you have come to the conclusion that it does not work, that you do not work your business, treat it like any other business: change something, come up with a new vision or close shop. Make projects on your own, try to prove that you are able to deliver something, even if you take the risk and cost of the project in full, without being supported by a brand. If more bloggers would ask the question more often about how to do to deliver a good product, instead of how to do to monetizez the blog, the blogosphere would surely be a better place, and many more bloggers would be noticed by the agencies. Your first thought cannot be as much as I earn today from the blog, but where and from whom I learn how to win later. Everything has to start from feeling good with yourself when you go home at night. The activities that inspire you and you always come back, that you could repeat over and over again from sheer pleasure and without getting paid, those are your inspirational source for a new business. Don’t get impatient if you have any doubts about your true passion, the safety of the right road doesn’t always come from the beginning! This is the part that involves passion and feelings, and feelings are not only positive, and that, in the great scheme of things, is a good thing. Exploration, self-awareness, questions, doubts will help you later. Don’t jump this stage. Still, passion does not place a business plan. The preliminary discussion with the accountant and the lawyer must be part of the initial preparations, ever since your business is an idea on a paper. Without a plan, you have no chance! No matter how good you are in what you do, how original, how passionate, without a plan, you will crash and burn, especially in Romania, where laws and Bureaucracys kill you before you are reborn. Switching from employee status to that’s entrepreneur is brutal. The effort is first and foremost mentally and not everyone can pass this test. It’s like walking on wire: for some it’s the most natural thing in the world and I can’t explain to others that they don’t do anything special. The Food Bloggers Conference – Summer Editon is the first conference I attended, in which the speakers discussed very seriously the legal and fiscal implications of starting a business. I welcome this initiative, even inclined in front of it, because these conferences have the unique opportunity to educate the public. Those who come before us, those who assume their position for example in their field, have the responsibility to educate and guide those at the beginning of the road. Next Post Inchidere firma prin lichidare voluntara fara lichidator. Formalitati.